SpartanNash currently operates more than 155 corporate-owned grocery stores in nine states, and distributes to more than 2,100 independent locations throughout the country. Our primary retail banners include Family Fare Supermarkets, Martin’s Super Markets, D&W Fresh Market, VG’s Grocery, Dan’s Supermarket and Family Fresh Market. Grocery retail stores owned and operated by SpartanNash are located in Indiana, Iowa, Michigan, Minnesota, Nebraska, North Dakota, Ohio, South Dakota and Wisconsin. In addition to a broad array of groceries, fresh produce and locally sourced products, these stores offer services that customers have come to expect, including a wide variety of quality meats and fresh seafood, bakeries, full-service delis with meal solutions and floral departments. Several stores have a pharmacy, as well as a broad selection of ethnic and international foods and natural and organic products. To learn more about each of our corporate-owned grocery retail banners, select the banner name below. The first Dan’s Supermarket opened in 1953 in Bismarck, N.D. and now has five stores serving Bismarck and Mandan families, delivering excellent customer-focused products and services. Whether shopping online for home delivery or strolling through Dan’s Pantry for everything you need from dairy to bakery and everything in between, store guests count on Dan’s commitment to quality, local products whenever available. Dan’s focus on nutrition, relevant coupons and weekly specials also helps customers find healthy solutions that meet their budgets. And when life calls for a special occasion, Dan’s catering comes through with specialty cakes, deli trays and fresh fruits and vegetables. Visit the Dan’s Supermarket website. Search for jobs at Dan’s Supermarket. In business since 1943 with a tradition of quality, freshness, high customer service levels and community involvement, D&W Fresh Market is for people who appreciate good food. With 11 D&W Fresh Market stores, our fresh market platform is the shopping destination for what’s unique and fresh and is where all culinary and service needs are exceeded. These premier grocery stores offer Starbucks, premium meats and cheeses, fresh sushi made daily, wine stewards, fresh seafood counters and fresh produce. Visit the D&W Fresh Market website. Search for jobs at D&W Fresh Market. Econofoods proudly serves communities across the Heartland. In each store, you’ll find fresh, local produce and quality meat – PLUS a convenient pharmacy, a deli, bakery and much more. You can shop Econofoods in Minnesota and Wisconsin. Search for jobs at Econofoods. Visit the Family Fare website. Search for jobs at Family Fare. 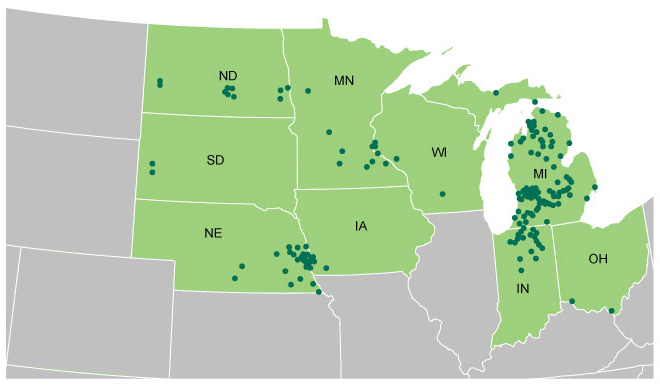 Family Fresh Market proudly serves communities across Minnesota, Wisconsin and Nebraska. We strive to bring you quality, affordable products you’ll be proud to bring home to your family. Visit the Family Fresh Market website. Search for jobs at Family Fresh Market. The first Martin’s Super Market opened in 1947 in South Bend, Ind. From that small beginning, Martin’s Super Markets has grown to 21 stores throughout Northern Indiana and Southwest Michigan. Martin’s was built on hard work, determination and innovative ideas, but it’s customer service that is the top priority at every Martin’s Super Markets. Each Martin’s employee is trained to meet customers’ needs, while providing the best quality products and greatest value for the dollar. Martin’s offers its customers added conveniences such as full-service pharmacies and specialty departments, including Side Door Deli Cafés, which offer a full variety of hot and cold ready-to-eat menu items. Community service and involvement are also high on the list of priorities at Martin’s Super Markets, sponsoring numerous programs that give back to the community. Visit the Martin’s Super Markets website. Search for jobs at Martin’s. Established in 1959, Forest Hills Foods has been the hometown grocery store for customers in Ada, Cascade and Forest Hills. It’s known for its fresh foods, easy meals, quality specialty items and superb customer service. The store carries organic and local produce, offers a fresh meat and fish department, a wonderful deli and bakery, a great wine and beer selection and flowers. Forest Hills Foods is the local gathering place for snacks, coffee and lunch. Giving back through community service efforts and charity donations is also important. Visit the Forest Hills Foods website. Search for jobs at Forest Hills Foods. Visit the No Frills Supermarkets website. Search for jobs at No Frills. Pick’n Save is a full service grocery supermarket, offering premium Angus Pride Beef, fresh and nutritious Miller Farms All Natural Amish Chicken and delicious Farmland Premium Standard All Natural Pork as well as fresh bakery, delicious deli and a variety of convenient services. Visit the Pick’n Save website. Search for jobs at Pick’n Save. SunMart proudly serves communities across the Heartland. Featuring fresh local produce, quality meat – PLUS a convenient pharmacy, a deli and a bakery and more. You can shop the SunMart way in Minnesota and Nebraska. Search for jobs at SunMart. Supermercado Nuestra Familia — serving the Omaha, Nebraska, market — features authentic and traditional Hispanic grocery products, fresh and colorful produce department, the Our Family® brand of high quality products and additional helpful services for you. Visit the Supermercado Nuestra Familia website. Search for jobs at Supermercado Nuestra Familia. ValuLand is a small-format neighborhood grocery store serving families that are value and budget conscious. With a rapidly growing number of stores, ValuLand is a low-price leader that provides a full-shop experience with produce and fresh offerings, all while offering hard-to-beat savings on everyday items. Search for jobs at ValuLand. Since 1961, VG’s has been a gathering place for food and friends with personal service by people who care. With multiple locations, VG’s stores are located on the east side of Michigan, catering to shoppers who like the personal touch. VG’s offers fresh, homemade and unique products delivered with genuine, caring service. These friendly stores offer fresh bread baked daily, deli meats and cheeses, a fabulous wine selection and fresh produce, while providing value for all your fresh food and grocery needs. Search for jobs at VG’s.